TPC Overall Rank: #220 out of 2933 rides. SFNE ran out of paint? It was rough but the airtime made up for it. There was more on this than Bizarro. I love the Cyclone. This ride has an enormous amount of personality. 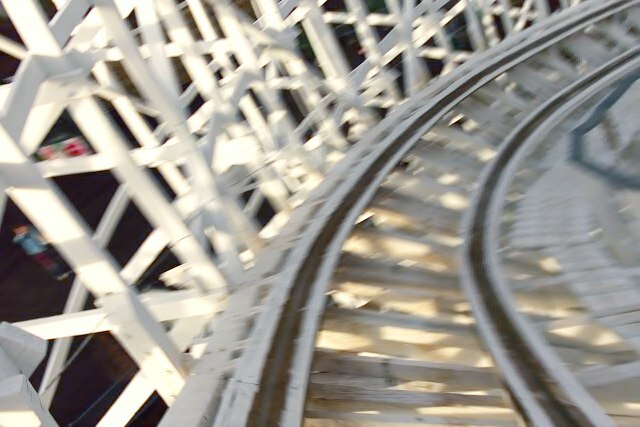 With all the new technology you see on wood coasters these days I love the way this coaster rides, without the awful &amp;quot;shuffle&amp;quot; you get on most coasters from this era, this one just throws you around. The ride offers little air time, but in the front seat you get some of the best ejector air time I've ever felt. Without the trim breaks, this ride keeps up its speed until the very end. With the trims it's a bit lackluster I'll admit. I ride this at least twice when I visit the park. 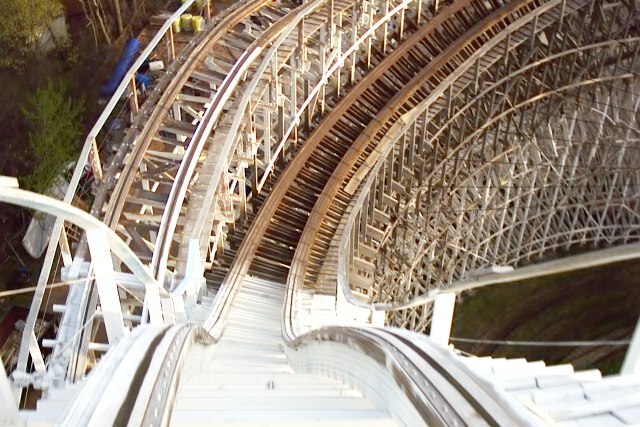 The first drop into the turn around is still one of my favorite first drops on any wood coaster to date, even though it was better with the longer drop, it's still better then adding a trim break! I give this a Don't Miss, because while it's not the best wood coaster you'll ever ride, you definitely don't ever ride another one like it! Unique for being what has got to be the most violent, busted and strickingly awful coaster experience I've ever come across in my life. Just nuke this thing! This mess has problems all across the board. Wether it's painful and horrifyingly brutal, wether it's boring and tedious. When I got to SFNE, I was really looking forward to it (after SROS, of course!). I heard it was a thrilling airtime machine. CoasterGrotto rated it 9.0/ 10! So halfway though the day, I went in with lots of optimism. But I've been consistently snapped in my face by countless flaws. At first, it just doesn't look really good. It's just a huge ugly mess of white wooden beams. And the queue line was just as depressing! Luckily, the line was a 20 minute wait, which could've been reduced to way under 10 if there were two trains running and if the operators were just a bit more disciplined. So, board the hyper (hyper!!) stuffed trains, and after a while, off you go. Already there, there's a really bad sing of what's awaiting you. You're going at about 10 kph and you can already feel vibrations, but it's when you hit the lift hill that you freak out. I don't know if this is normal on these types of woodies, but once my car reached the climbing angle, it was bouncing back and forth, like, seriously. I was freaked out. I was scared. I was fearing for my life. The ride I got though was much worse than I expected. It was intense in parts. It was stuffed with airtime and laterals. But it was an absolute pain. During the more intense part, like the first drop, the vibrations of my car were FIERCE. I was thrown every which way in my seat as I was desperately hanging on for dear life. Many of the faster segments felt like rolling down a hill in a barrel: EVERY THRILLING ASPECT REGARDING THOSE PARTS WERE DEMOLISHED MY THE ROUGHNESS. Cyclone is not a beast in which claws you can actually sit down and enjoy yourself: The fact that you're thrown everywhere all the time absolutely kills any fun that could've been had here. It's not thrilling, or exciting, it's just plain abusively violent. Just flat-out BAD. And what about the milder parts, like the second turnaround and the twisted ending? Could've these been moments to try to relax and uncover? Or actually enjoy? Well, no! You're not treated to any of that sick ragdoll effect you just lived through, but you still can't relax, more like because you're bored and so annoyed! Bored my the terrible pacing: the trim brakes cut the speed heavily. And annoyed by some omnipresent vibrations: it's so busted and rough it seems like no matter how fast it goes, it'll never roll smoothly. It is FULL of bumps, and you just want those bumps to end. The ending, which takes almost one half of the coaster's lenght, is terrible! The trim brakes kill all feelings of speed or G-forces, except those of the vibrations. And the fact that the coaster ends in such a mediocre and depressing tone makes hitting the brakes and leaving the ride feel all the more cheap and unsatisfying. It jsut leaves you with a nasty smile of disgust. However, I do give Cyclone credit for three little things. -First, if you're some kind of a sick dude who likes to beat himself, you're likely to find what you're looking for here. God are you in for quite a shake. -Second, congrats SFNE for stuffing the car cushions so much. You may get shaked up like a ragdoll all around, but try that in a sofa. The softness spares you quite some pain. -Third, I have to say, the dip after the evil trim brakes (halfway through the ride) ROCKS!! It's surprising and it gives a freaking high amount of airtime. This part right here is great. Too bad the rest is just absymal. Well, I've recommended you try Great American Scream Machine (Great Adv) if you were curious about how it feels. You won't be satisfied in any sort of way, though at least, it will have been worth it because by then, you'd finally know how it feels. Now with Cyclone, it's a totally different story: if you're curious about how it feels, don't give it a try. You'll be disturbed, shocked and just plain disgusted. It's not a good experience. In fact it's just an insanity test. As the past Riverside Cyclone, I heard it was a phenomenal legend. Unfortunately it is also a fact that as the -P A S T- Riverside Cyclone, it's just not good for you today. I haven't ridden Cyclone in its &amp;quot;glory days&amp;quot;, but this coaster deserves a 4 as it is. Usually only one train is running on this beast, but waiting time barely exceeds half an hour or so. The restraints are extremely sketchy, but that only adds to the fun by allowing us to truly experience airtime (plus a seat belt, but we'll ignore that for now). That being said, Cyclone is the most out-of-control rollercoasters that I've ever been on. It's rough, but so what? It's not very painful (if you're looking for pain, ride Flashback in the front row), but it's very rough. But the roughness is what gives Cyclone its personality, its character. This ride is the most underrated out of all of the rides in the park. Make sure you go on Cyclone besides the bruises and pain horror stories, you won't regret it. This, yet again, is a posthumous review. The coaster as it currently exists possibly merits a 6 or 7. Although, in it&#39;s original form, was not only my favorite wooden, but overall favorite coaster. Bill Cobb designed this monster while undergoing heart surgery and it shows. 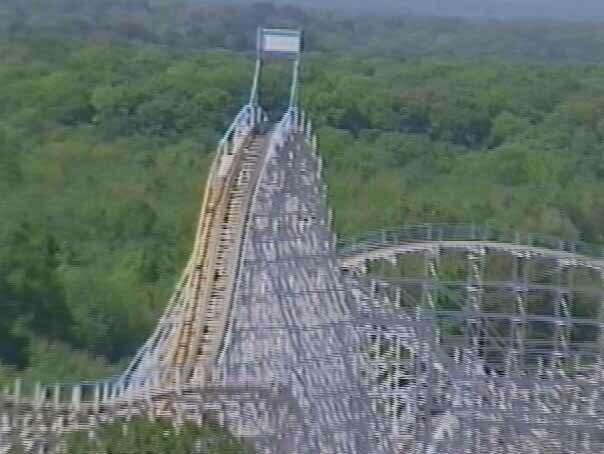 The original first drop (which is still visible) was the most intense moment I have ever experienced on a coaster. The type of moment, where it was hard to place where exactly you were on the drop, although you had experienced it again and again. We always complained to Riverside management that they should replace the Morgan trains, but I would never have asked for the first drop to be re-profiled. It should be considered one of the great coaster sins! This is the coaster that almost completely stopped me from riding coasters. The ride totally scared me. I felt like the whole ride would fall apart and the ride was insanely rough throughout. There are no fun qualities about this. This ride is simply amazing. the twister layout is great and the drops are awesome too. i do not know what everyone is complaining about. Sure its rough but most old woodies are. This ride would get a perfect score if six flags had not reprofiled it and the brakes were not there along the course. Very slow moving line when there is only one train running. This ride will beat you up. Its bumpy rickety and will throw you side to side. If the ride where smoother it could be pretty great. There are a couple of good drops in it. It still is fun just as long as you dont back problems. I dont know why this has gotten such terrible reviews. I sat near the back and experienced no pain, just a wild ride. Now I like the bumpyness of woodies, and have never gotten hurt on any of the ones Ive ridden. Splitting headaches for some must have affected their judgement of the Cyclone, because I see no reason to rate it low. Just high.